If your garage door opener is beeping every 30 seconds, you most likely need to replace the backup battery in your automatic opener. Backup batteries open and close your garage door when the power is out and last 2-3 years under normal use. 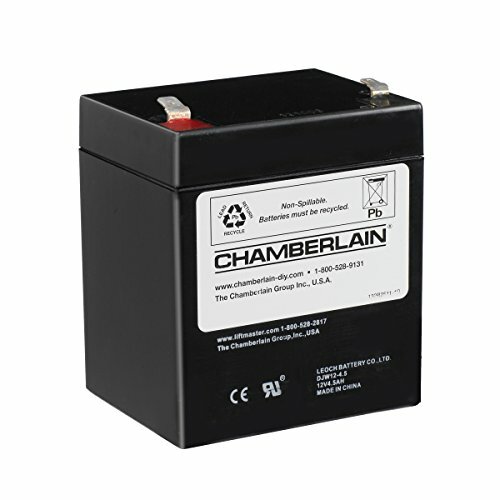 Below is the Chamberlain 4228 backup battery that fits Chamberlain, Craftsman, and LiftMaster garage door openers. 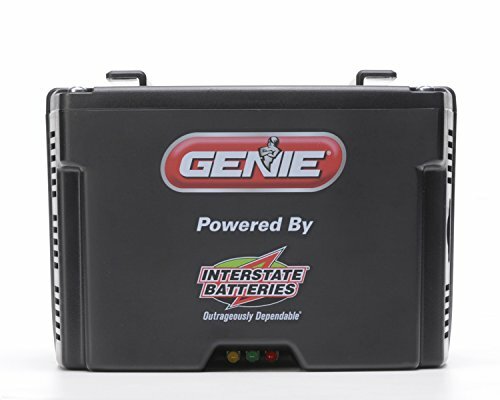 Genie garage door openers will use the Genie GBB-BX external backup battery to power select models. Read further for more info. What Is a Battery Backup Garage Door Opener? A battery backup garage door opener is equipped with an internal or external battery that provides power to open and close your garage door during a power outage. The battery is designed to operate your opener 20-50 cycles in a 24 hour period. Some models have internal batteries while others use an external battery that is mounted near the motor head. This feature is a nice convenience for anyone living in an area where the power goes out frequently… especially when the weather is bad outside and your trying to get into your garage. You might have recently purchased or rented a home and not realized the garage door opener was equipped with this battery backup feature. Backup batteries in garage door openers last around 2-3 years. The battery sits in a standby state until the power goes out and its needed to open the door. A nice feature is most openers will warn you when the battery is bad with a beeping sound instead of having to find out at the worst possible time… a power outage. Can I Replace the Backup Battery Myself? Sure can, its very easy. First, start by unplugging the garage door opener. Below are instructions that will help you replace the backup battery in the most common units with internal and external batteries. Behind one of the light covers on the opener motor is the door for the battery backup. On most systems you will need a flathead screwdriver or 1/4” nut driver to open the door. Pull the wires on the battery out enough so you can grab the battery. Disconnect the red and black wires and recycle the battery. Plug your new battery in using the red wire for the terminal marked "red" and the black wire for the terminal marked "black". Install the battery into the slot with the terminals facing outwards. The batteries are sealed so there is no worry of fluid leaking when laying them on their side. Reinstall the cover and your finished. Don't forget to plug your garage door opener back in. If you have a Linear LDCO800 opener equipped with an internal backup battery, unplug the opener and see if it will run. If the unit does not run, then the internal battery needs to be replaced. This is a very simple process any DIY homeowner can perform. Doing a quick google search for “replacing Linear LDCO800 battery backup” will yield some very informative YouTube videos that will walk you through the whole process from start to finish. The Linear LDCO800 opener does not come standard with the battery installed. It is a “backup battery compatible” garage door opener. If you did not opt for that option when you had the opener installed, then your opener most likely does not have backup battery. You have to purchase it separately. You might have a Linear LDCO800 garage door opener and not even know it. Precision Garage Door Company uses private label Linear garage door openers with their Precision Door logo on the motor head. The unit will look exactly the same except for the logo on the outside cover. All Genie garage door openers use an external battery backup like the one featured above. This battery plugs into the opener to provide power with a 3ft connector cable. You will notice if your opener is equipped with this battery because it will be mounted on the ceiling or the angle used to hang the opener. To replace a bad Genie backup battery, first start by unplugging your Genie opener from the wall outlet. Next, unplug the battery from your garage door opener and remove it from its mounted location. Install the new battery in its place and plug the battery back into the Genie opener using the connector cable. Plug the Genie opener back into the wall outlet and your all done. LiftMaster wall mount openers use an external backup battery that plugs into the bottom of the unit with a cord. They are very easy to install and they feature a bright LED light to let you know the battery is operational. An audible signal sounds when using the jackshaft opener under battery power. Chamberlain, Craftsman, and LiftMaster also made some Estate Series garage door openers that used this battery as well. They have a connection port on the unit for the battery to plug in. To replace the external battery, first start by unplugging your opener from the wall outlet. Next, you can disconnect the backup battery from the opener and remove it from its mounted location. Mount the new replacement battery in the same location and plug it into the opener. Plug the opener back into the wall outlet and your all set. You now have a new backup battery on your wall mount garage door opener. If you have a battery backup garage door opener from Chamberlain, Craftsman, or LiftMaster, these units have a visual LED light along with an audible beep that gives you the status of the battery. Each color and audible tone represents a different status. 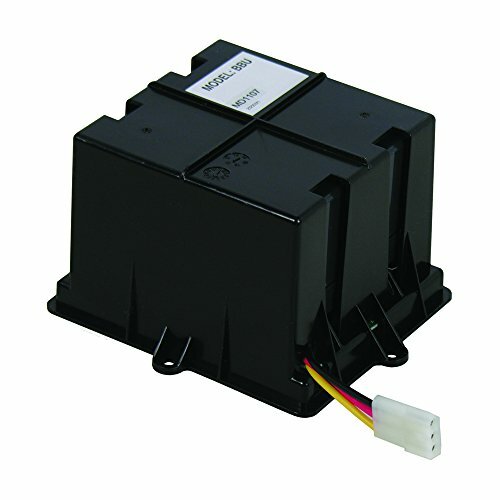 Can I Add a Backup Battery to My Existing Garage Door Opener? Yes and no. Not all openers will accept a battery backup. Read below for more information about which brands and models will allow you to connect an external backup battery. The Genie GBB-BX external battery backup is designed to work with any Genie branded Revolution series, SilentMax, Excelerator II, PowerMax or ChainMax models manufactured after January 1, 2013. Per Genie’s website, TriloG and IntelliG models made before October 2012 will need a new circuit board and wall console to accommodate the battery backup. 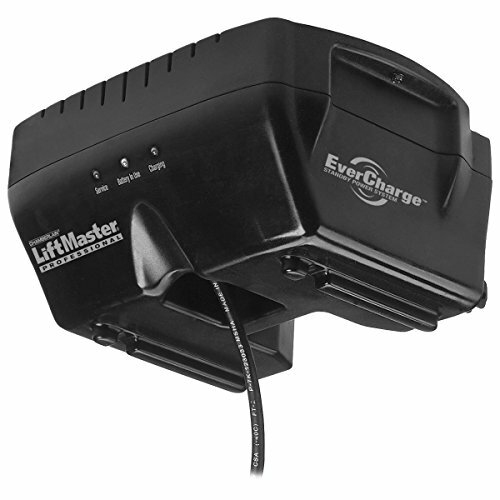 The LiftMaster 475LM external battery backup is designed to work with the LiftMaster 3800 and 8500 wall mount garage door openers and Estate Series models. This external battery includes a 3ft cord that plugs directly into the wall mount opener. The battery charges through the port on the opener and maintains its charge from this connection. Installation is very easy. There is no way to retrofit a Chamberlain, Craftsman, or LiftMaster opener with a battery backup unless it was equipped with a battery from the factory. Your model has to come from the factory with the removable side cover and battery terminals. With that being said, there were some Estate Series units manufactured that did accept an external battery. The Linear LDCO800 opener is backup battery compatible. They do not come standard with a backup battery but you can easily install one yourself. Linear offers very easy to follow videos online that help with the installation. Doing a quick Google search for “installing Linear LDCO800 backup battery” will yield some awesome tutorials videos that will walk you through the process from start to finish. It is a very simple process. To save battery power, the light bulbs on the garage door opener will not work when the unit is operating under battery power. The reason for this is to direct all energy from the backup battery to the operation of the garage door opener. When the power is restored, all lights on the opener will operate like they did before. Do I Have to Replace the Battery Backup? No. If you wan’t to permanently stop the beeping without replacing the backup battery, follow these steps. Unplug the opener, disconnect the battery, and plug the opener back in. You will no longer hear the beeping sound. Keep in mind, you will not have a backup battery to open and close your garage door if the power goes out. The small price of the battery pays for itself the first time you need to use it. Safety and piece of mind with a small price tag. If you have a MyQ opener from Chamberlain or LiftMaster, the unit will beep when the door is being operated from a smartphone. The reason for this is to warn anyone in the garage the door is about to close. The great part about this feature is if anyone in the garage crosses the safety sensor beam, the door will not close. The warning sound is a UL requirement for garage door openers that have the ability to close from a remote location. There is no way to turn off or lower the volume of the beeping sound that comes from your MyQ garage door opener. These specifications are determined by governing agencies for safety compliance. If you have a Guardian or Tachyon garage door opener, you might be hearing a beeping noise due to the safety sensors being misaligned. This brand of opener will beep 20 times when the safety sensors are out of alignment. You will need to re-align the sensors so they make a connection across the opening of the garage door. The red light is the receiver and the green light is the sender. In our experience, these openers are very finicky. If the sensors won’t align, check the wiring by the safety sensors or up by the motor head of the opener. Many times installers will get in a hurry and leave an exposed wire that causes the sensors to ground out and not work properly. You can also check the wiring if it is installed on the outside of the sheetrock to make sure there is not a staple that was accidentally put through the wire. We have seen in many instances where the opener worked for months and all of a sudden a staple that was shot through the safety sensor wire is now causing problems several months later. Battery backup garage door openers are becoming more popular as severe storms and weather patterns show up throughout the U.S. knocking out power to homes. Having the ability to open and close your garage door with the push of a button is a huge convenience, especially if your door is too heavy to lift or if you don’t know how to lock it manually. 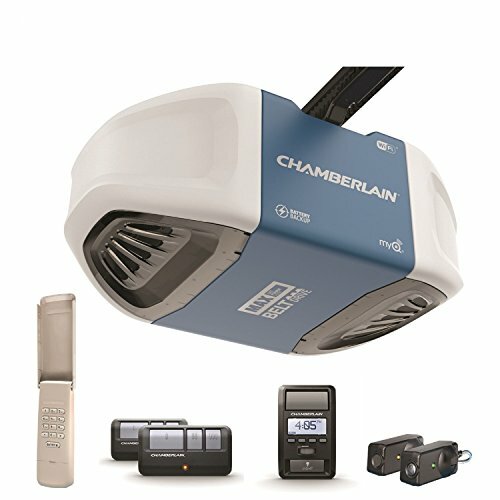 If you are looking to purchase a new battery backup garage door opener, we recommend the very popular Chamberlain B970 Belt Drive Wi-Fi garage door opener with MyQ smartphone technology. This opener features an ultra-quiet belt drive system with a super smooth DC motor. You can control the opener from your smartphone with no monthly fees with a free app. Click here to read our review on this unit.